Even though Mr. Stan has been a candidate for council many of you may not know him. My explanation for that is because he works. He is fully occupied in his primary career performing financial analysis. His competence in financial matters permeates the discussion even if a stereotypical numbers personality often shows. Of all the candidates for Council at Large, Mr. Stan’s election provides the best opportunity for us as residents to be given good read ahead materials and see open discussions. Chase Warden is the nephew of my good friend Randy Warden. We have discussed Chase’s interest in politics for a number of years. I have had the opportunity to talk with Chase on a number of occasions and encouraged him to run this election. His good friend is Councilman Ethen Reynolds of New Carlisle. Ethan has provided him with a lot of support. I appointed Nancy Bryge to the Ward 5 seat after the resignation of Council Women Dudley. I truly believe I did not misinterpret her commitment to the impartial evaluation of the issues she talked about during our interview. However, shortly after her appointment, she showed up with Council Member Campbell to a forum concerning the Carriage Trails supplements. Since that time, Ms. Bryge adopted an attitude that makes it impossible for her to evaluate the merits of points I make. Even items where we essentially agree she opposes just to oppose. For instance, she proposed improving Baseball Field One at Cloud Park. I was for everything in the improvement proposal except putting in a permanent fence without first coming up with a plan for what to do with the soccer field located in the outfield. That field is fully used by rec soccer every year. Looking at her decision to agree to run for Council at Large, completes the proof she is easily manipulated. Everyone knew there would be a contested primary for Council at Large. Anyone with any political savvy would know that Mr. Campbell had the best chance of advancing in a contested primary. Additionally, her status as the incumbent in Ward 5 gave her the best chance at maintaining a seat on council. Her running for Ward 5 and Mr. Campbell running at large provided the best chance for the “old” council to maintain their voting bloc. Yet Ms. Bryge was convinced to run in the “at large” race against the best interest of herself and the best interest of the voting bloc. Do not be fooled into believing this was a decision she made. When you talk with her, she absolutely will be able to convey that she is convinced it was her idea to swap races with Mr. Campbell. She genuinely believes it. But logic shows at least one person thought it was better for her to be the sacrificial lamb than taking a chance at Mr. Campbell not having a seat on council. I could respect a decision made for this purpose and an honest discussion of this logic. But that is not a discussion we will see. Instead we will have to make our decision on the facts we see, and the explanation she gives. That leads to the question, “can we really afford to have someone so easily manipulated representing us on council?”. I feel the need to talk some about my view of Mr. Campbell. A reader of my blog might get the wrong impression that I do not like him or that I hold the same negative opinion of him as some of his greatest detractors. My assessment is much more complicated than that and I am sure it does not come through when I reference him in my posts. Mr. Campbell is obviously the smartest person on council and I like being around smart people. Add to that he comes well prepared and he has a lot of experience. I have not yet interviewed the person running against him in the November. In order for me not to endorse Mr. Campbell in November, either someone will have to come with proof of some of the many illegal dealings his detractors like to spread in rumors or the person running against him in November turns out to be an obvious genius. That said, it does not change the fact that I have issues with Mr. Campbell’s leadership style and political philosophies. As I mentioned in previous posts, Mr. Campbell likes all “work” to be done behind closed doors and then provide the public with a sales pitch containing only good aspects of the decision. This method does not work because no matter how smart a person is they cannot always make the best decisions. Even the smartest person can learn from others. 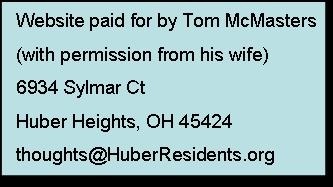 A specific problem with back door negotiations/discussion in Huber Heights is that in a one on one conversation there is not a member of council or staff immune from his ability to manipulate. In order to be successful, he is likely to try anything. We do not know how many of these techniques are unscrupulous or illegal but we can mitigate any damage that could be caused, if some of them are, if we have full discussions in public. As a public figure with the ability to vote for or against resident’s projects we naturally are going to upset some residents. Unfortunately, this often results in that person lashing out with unfounded stories, theories and rumors. In Mr. Campbell’s case, 70% of all the negative rumors seem to generate from one source. This seems to have been generated because Mr. Campbell displays a preference to develop around the interstates and the offended someone that advocates for a city center concept. On the other hand, I’ve had newspaper reporters tell me there have been instances where he provided information they did not feel comfortable getting because it was nothing more than dirt. I’ve talked with a former council member that made allegations so serious that if the former member of council would be willing to go on the record with details, they might make me ask for charges. I definitely would campaign against him. Personally, our relationship has gone through phases. He tends to try to act like he thinks I perceived him. The first phase was the most uncomfortable as he pretended to be flighty and easily befuddled. For years, I had watched him come prepared and display great command over the issues in the administration committee meeting so I was confused by our first private conversations after the election. My contention has always been the public needed the information Mr. Campbell possessed when he ran the meetings, so that we could help refine the some of the decisions made on behalf of the city. 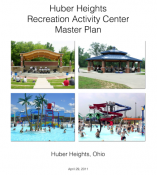 Like planning to build an Aquatic Center with no public input until after all the details were set and giving no bid contracts to friends. Not once had I considered him to be flighty or befuddled. I was relieved when we finally got to the point where he was just pretending not to know much. I still do not know the reason for the first phase but the second phase makes perfectly good sense. He uses the technic of making it seem like he needs your knowledge in order to build rapport. Though I was initially relieved to get out of the first phase, the processes of having to “discover” information that you know he already knows does get old. Lately, we have gotten to the place where he is willing to state facts he knows. Of course, there are some facts that take longer to retrieve than others but the recent conversations are more natural. The technic that appears that concerns me most is the divide in private in order to create allegiances in public. This is the technic that prompted me to write this section. In private, he proposes that staff created this plan to keep council bickering. By dividing council, they would be unable to provide effective oversite of their work. It may be possible this technic is being used by the City Manger, but it definitely is one used behind the scenes by Mr. Campbell. For instance, I did not know that Ms. Bryge had an issue with what she claims about her Master’s Degree and the actual reality of her Master’s Degree until Mr. Campbell mentioned it. In fact, I still do not know if there is an issue with her resume but I do know this is the kind of plant used to try and fuel discord between one member of council and another. I do not know what kind of comments were made behind the scenes that turned Ms. Byrge from someone that I fully expected to be able to evaluate the merits of my arguments to one that reflexively disagrees and adamantly opposes any point I make. I do know that there will be issues in the future where even someone as smart as Mr. Campbell will advocate for a bad proposal. A council member that can so easily be manipulated into believing it was in their best interest to give Mr. Campbell a free pass to the general election, is not the kind of council member that can be relied upon to protect us from poor decisions in the future. There will always be people that make up stories because they cannot get the city to pay for their pet projects. There will always be personality conflicts and things written and said that might cause hard feelings. When it comes to doing the business of the City decisions have to be made based on the details of the issue which means those details have to be discussed. A member of council cannot be an effective representative if they are making decisions based on personalities instead of on the merits of a project. Click on the link if you interested in Mayor? How about Issue 4? Issue 7? A no vote on Issue 11 is a vote for transparency. “Old” council and “new” council are words that do not really represent the factions very well but they are the terms that people seem to understand.